From left, Polk County Middle School teachers Stephanie Luedi and Elisa Flynn and Polk County High science teacher Jennifer Allsbrook at the NSTA gathering in Atlanta. 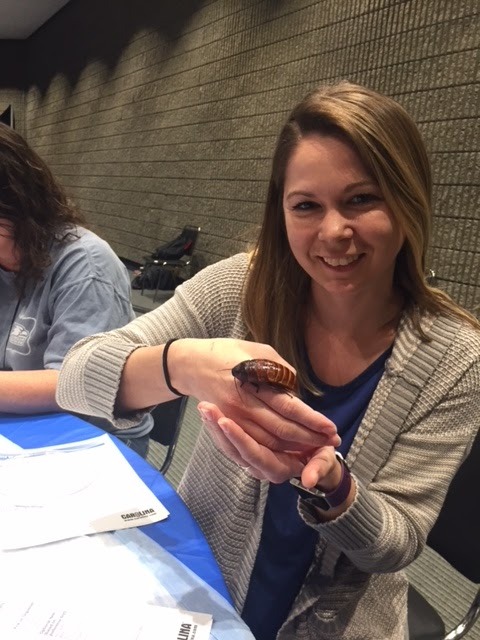 Seven Polk County Science teachers attended the National Science Teachers Association Conference in Atlanta earlier this year thanks to a Priscilla and Ellis D. Slater Excellence in Teaching Fund grant from the Polk County Community Foundation. The conference brought together science teachers from all over the nation to attend informational sessions designed to help improve their classroom instructional efforts. Polk County High School teachers Ethan Abbott, Jennifer Allsbrook, Shannon Haynes and Leslie Rhinehart, Polk County Middle School teachers Stephanie Luedi and Elisa Flynn and Polk Central Elementary teacher Andrea Walter attended the conference. “One session I really enjoyed was on scientific literacy. The presenters led the participants through a strategy to encourage deeper engagement and comprehension when reading scientific articles. The strategy is called an anticipation guide. “I have been teaching for 25 years, but most of that time has been spend teaching the biological sciences. I double majored in biology and chemistry in college, but I have not had the opportunity until this current school year to teach chemistry. Needless to say, my content knowledge was a little “rusty” (pardon the chemistry pun) and the opportunity to attend sessions that focused on teaching strategies ranging from gas laws, periodic table, chemical reactions, stoichiometry and more was phenomenal. “This was the first conference I have ever attended. While I was always told of the amazing ideas and strategies shared at these conferences I could never finance a trip to one on my own. . . I was thrilled to find out that not only would I be attending the conference, but that I would get to do so with my colleagues to help guide and share the experience. “Sessions included hands-on activities with Arduino systems for basic build and programming ideas in my Engineering class, hands-on activities with current Vernier technology already in use in both the General chemistry and AP Chemistry classes as well as new strategies to model conceptual chemistry concepts better for students. “I was in need of a change and fresh ideas for my ecosystems unit. This ended up being a great session that I molded my whole ecosystems unit around. The lesson shows students how to write “What I See” statements from a picture or observation and then they write “What It Means” statements after they investigate and learn about what is going on in the ecosystem. They then take these statements and piece them together to form a summary. They look at direct and indirect relationships between species and how disturbing one species can impact other species in the ecosystem. It helps them to understand how to write about complex relationships that happen in nature. “The National Teachers Conference offers amazing opportunities for teachers in any subject. Science teachers especially need the chance to gain knowledge in an ever changing area. * There are new national standards for science (The Next Generation Science Standards), which, while not yet adopted by North Carolina, clearly delineate the best practices for teaching science. The new practices call on students to shift from learning about topics to figuring out why or how something happens, and therefore science teachers must shift from teaching about science to teaching how to use science to understand phenomena in the world/universe. * Developing my content knowledge about the core ideas in science – many sessions provided an excellent overview of current concepts, theories, technology, and best practices.